An extremely rugged pump, the 10" (250mm) CD250M Dri-Prime pump is capable of flow rates to 3600 gpm (227 l/sec. ), total dynamic heads to 180' (54.9 meters), and solids handling capabilities up to 3-1/8" (79mm) in diameter. The CD250M also features the unique Godwin high pressure oil bath mechanical seal that allows for indefinite dry running, perfect for intermittent flow applications. All of these features come standard on a highly maneuverable highway trailer or compact skid for convenient use. Package DOES NOT include suction hoses, discharge hoses, fittings, or flanges. Performance data listed in table and curves based on water tests at sea level and 68° F (20° C). Larger diameter pipes may be required for maximum flows. 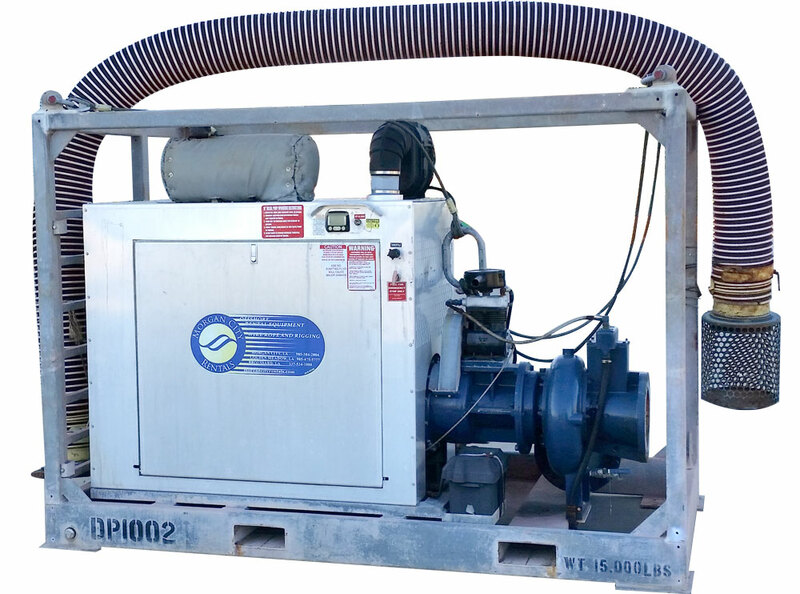 Close mounted arrangement carrying pump and vacuum priming compressor mounted to a diesel engine or electric motor. Cast iron construction solids handling pumpend. Stainless steel and other hardened materials also available. Extensive application flexibility — will handle raw sewage, slurries and liquids with solids up to 3-1/8" (79mm) in diameter. Continuously operated "Godwin” air ejector priming device requiring no form of periodic adjustment or control. Dry running, high pressure oil bath, mechanical seal with high abrasion resistant silicon carbide interfaces. Solids handling swing check Non Return Valve. Compact unit mounted on a skid base or two-wheeled highway trailer both incorporating integral overnight running fuel tank. Simple maintenance, normally limited to checking engine and seal cavity oil levels. Standard John Deere 6068T or Caterpillar 3056TA engine. Also available with a variety of other diesel engines or electric drive motor. A variety of silenced units are available.